Kite provides a set of tools that handle the basic legwork for creating a dataset, allowing you to focus on the specifics of the business problem you want to solve. 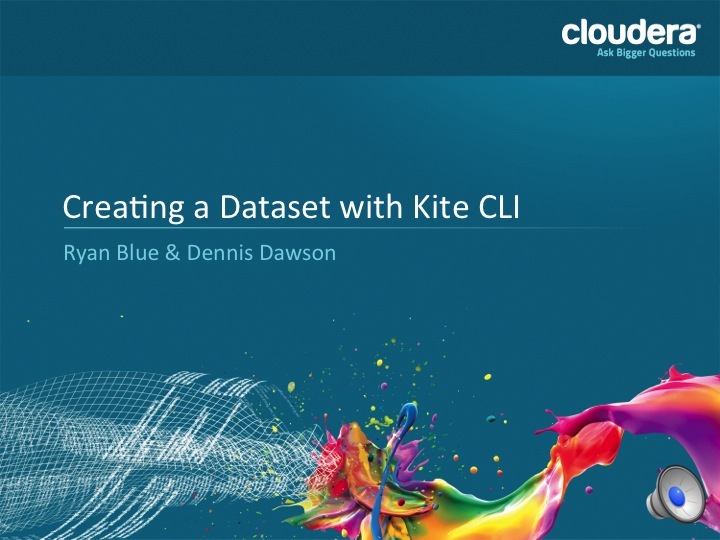 This short tutorial walks you through the process of creating a dataset and viewing the results using the command line interface (CLI). If you have not done so already, install the Kite command-line interface. If you have a CSV file sitting around waiting to be used, you can substitute your file for the one that follows. The truth is, it doesn’t matter if you have 100 columns or 2 columns, the process is the same. Larger datasets are only larger, not more complex. If you don’t have a CSV file handy, you can copy the next code snippet and save it as a plain text file named sandwiches.csv. Reuben,Pastrami and sauerkraut on toasted rye with Russian dressing. PBJ,Peanut butter and grape jelly on white bread. All right. Now we get to use the CLI. Start by inferring an Avro schema file from the sandwiches.csv file you just created. Enter the following command to create an Avro schema file named sandwich.avsc with the class name Sandwich. The schema details are based on the headings and data in sandwiches.csv. If you open sandwich.avsc in a text editor, it looks something like the code block below. csv-schema infers the names of the columns from the header, and the data type for each column from the first row of values. With a schema, you can create a new dataset. Enter the following command. While it does not create actual sandwiches, it does create an empty dataset in which you can store sandwich descriptions, which is the next best thing. Probably. Just for giggles, you can reverse the process you just completed and look at the underlying schema of your dataset using the following command. You’ll get the same schema back, but this time, trust me, it’s coming from the Hive repository. Honest. You’ve created a dataset in the Hive repository, which is the container, but not the information itself. Next, you might want to add some data so that you can run some queries. Use the following command to import the sandwiches in your CSV file. The method returns a record count. Added 2 records to dataset "sandwiches"
But can you believe that? Inquiring minds want to verify that the information is actually in the dataset. You can list records from your newly created dataset using the show command. By default, CLI retrieves up to the first 10 records from your dataset. If you find that number of sandwiches overwhelming, you can change the number of records the query returns. This time only the first record prints to screen. You can import additional records to the database and use Hive or Impala to query the results. Given the ease with which you just created the sandwiches dataset, it seems a shame to destroy it out of hand. Keep in mind that this was only an example, and not something you were meant to treasure. I suppose you don’t have to delete it, you might want to keep it around as a souvenir, like the first dollar earned or something like that. If so, create a dataset you hate, and prepare to annihilate it using this unassuming command. There they go. Reuben and PBJ are gone. But you can create them again, or any other dataset you choose, using the CLI.